The bear came over the mountain, the bear came over the mountain, the bear came over the mountain, and climbed up on the porch... My friend Carole, who I went to high school with, lives on top of a mountain in north Georgia. The view out the french doors and bank of windows across the back of her house is fabulous - woods that go straight down and gorgeous mountains. Shortly after she and her husband moved into the house, they looked out the window and there was a bear sitting on the porch railing, eating out of the bird feeder. They had the presence of mind to grab the camera and take a shot or two. I would have been strolling high-tailing it up the stairs to the top floor and praying that bear didn't figure out how to open the back door! 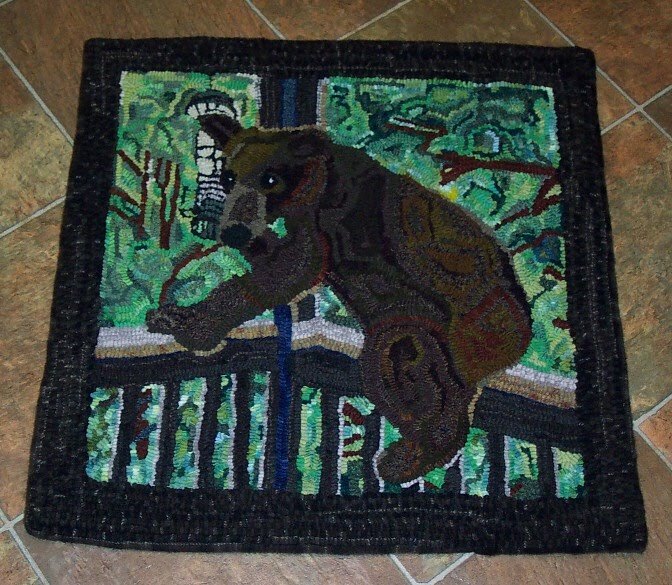 In any event I was just enchanted by the picture and of course that became my next challenge to myself for a hooked rug - try to hook a bear. After many months I finally finished that rug a couple of weeks ago and took it up to Carole as a surprise last weekend when we met for lunch. Enjoy! How strange, my sister's name is Carole, and she lives in/on the North GA mtns. also. They have not had a bear sitting on the porch rail, but they have had bears climbing up close trees to get the bird feeders at night. My sister now brings in the bird feeders on the porch every night. Your rug is wonderful, I am sure your friends will enjoy this conversational addition. What a lovely piece you have created. I'm sure it will be quite a conversation piece in their home for many years to come. The rug/hanging is SO gorgeous! I love it! I love that you did it with a friend (and said bear) in mind! You my dear,,,,are the BEST in SO many ways, in what you create, what you POST,,,,share! Love that I just get to keep knowing YOU abit more all the time! Talked to LULU abou the EBC Button on the phone this morning. She's not been well, but hopefully we'll have a Button and a LINK on Both our blogs soon! Have a GREAT week and I'm doing another SIMPLE giveaway this week! It is a lovely piece of work. My friend yesterday was driving through sharon CT and hit a bear. He ran across the street. I felt so sad about this. He was still alive laying behind a tree. I hope they can save it's life! It was nice to have you visit me, it's such a delight hon! What a wonderful gift, and how thoughtful of you to create this for them! Oh my gosh! What a beautiful gift! I love it! Thanks for your comment, your Rug is fab :-)and the cake for your son too. Beautiful and amazing! What a talent you have. I'm sure Carol loved that gift. She'll always remember that encounter thanks to you.